If you are a veteran, spouse or widow/er of a veteran facing the costs of home health care, assisted living, or nursing home care, or if you are a family member caring for a veteran, spouse or widow/er of a veteran, you may qualify for up to $18,120 per year of additional benefits to help pay for care. The benefit is commonly called the Aid and Attendance Benefit. Although it is technically a “pension”, this is not the same pension benefit that most of us think of when we hear the word “pension”. Many veterans wrongly believe their income is too high to qualify, and that they must have been in actual combat or suffered a service-connected disability to qualify. Call Joanne to schedule a consultation at (262) 347-2820. 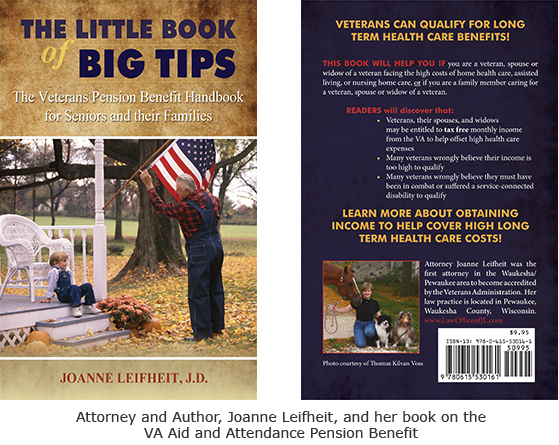 Also, veterans may stop by Joanne’s office to obtain a free copy of her book, The Little Book of Big Tips, The Veterans Pension Handbook for Seniors and their Families. (Please bring a copy of your DD-214 to obtain the free copy). 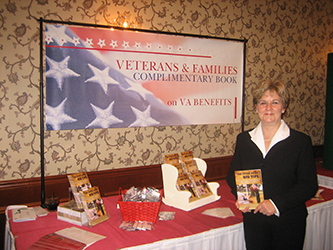 To order a copy of the book, please send $13.16 (made payable to Attorney Joanne Leifheit) to: Attorney Joanne Leifheit, N27W23953 Paul Road, Suite 107, Pewaukee, WI 53072. This includes tax, shipping and handling, and the cost of the book. All net proceeds will be donated to a veterans organization!